The year 2006 marked a special occasion for the United States Mint. It was the 20th anniversary of the mint’s popular Gold American Eagle and Silver American Eagle coins programs, the nation’s official gold and silver bullion products. For a limited time, the 2006-W ½ oz Proof Gold American Eagle is available in perfect condition on Silver.com. Twentieth release of Gold American Eagles in this weight! Earned a grade of PR70 from the PCGS. Deemed a Deep-cameo coin for its visual brilliance. Bears the “W” mint mark from the West Point Mint. 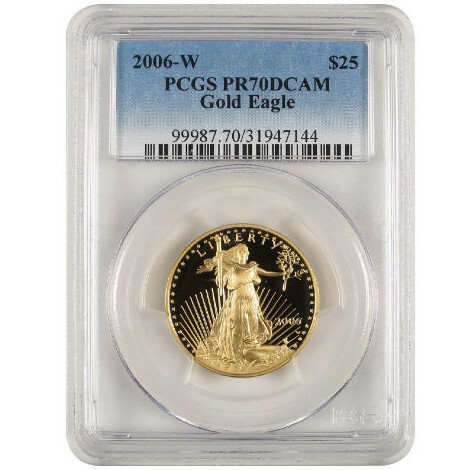 Proof Gold American Eagle coins were introduced for the first time in 1986, making 2006 the 20th anniversary year of the program. The US Mint celebrated by expanding the program for the first time since 1988. When the coins were introduced, the bullion version had four weights and the proof version featured just a 1 oz coin. In 1987, the ½ oz proof was introduced, followed by the ¼ oz and 1/10 oz coins in 1988. Fast forward to 2006, and the US Mint introduced a burnished version of the coin in all four weights. 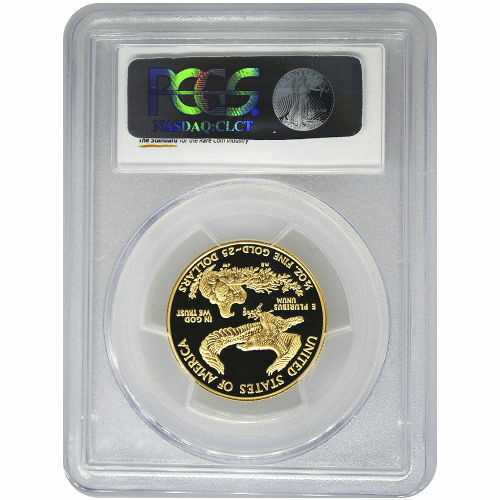 The 2006-W ½ oz Proof Gold American Eagles in this Silver.com listing have perfect Proof 70 grades from the PCGS. Specimens such as these have their full, original mint luster and no detracting flaws on the surface. When a coin is deemed to have a Deep-cameo finish, it means there is a stark contrast between the design set and its background field. In this case, these Proof Gold American Eagles have a strong, frosted design set and a deeply-mirrored, clear background field. On the obverse you’ll find Augustus Saint-Gaudens’ 1907 depiction of Lady Liberty guiding the nation toward an unknown future. The reverse features the image of a family of bald eagles in its nest, and was created exclusively for the Gold American Eagle program by Miley Busiek. Silver.com encourages all shoppers to ask questions when they arise. If you need to speak to a Silver.com associate, you can start by calling us on the phone at 888-989-7223. We are also conveniently available online using our website’s live chat or by submitting questions in an email. 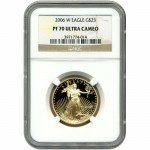 If you are looking for similar items, check out our selection of Graded Proof Gold American Eagle Coins.